Please apply even if you’re not sure, we’d like to see your face! Here’s part 2 of the initiative! Are you a woman identifying, person of color, or LGBTQ oriented human who would like to attend Origins and volunteer for Games on Demand? Check out our fundraiser for Origins! We’ve been trying really hard to get more diversity to our lovely Games on Demand event at Origins Game Fair in Columbus, Ohio. This year, Jay Treat has organized a fund raiser to help us do exactly that. As we all know, cost is one of the biggest barriers for women, people of color, and lgbtq folx to attend conventions. Help us bring them to Origins 2016 so they can run games, network with industry professionals, and have a blast at Games on Demand. Are you coming to ORIGINS? I don’t know WHY YOU WOULDN’T ITS THE BEST CON. IT’S BASICALLY IN MY BACKYARD. COME RUN GAMES AND EAT FOODS AND ICE CREAMS AND LAUGH AND DRINK BEERS WITH US! Never ran a game at a con before? We can give you some advice! You can also volunteer in different ways to help out! We aim to be an inclusive, diverse space, and are always trying new things to MAKE IT SO. In case you forgot, here’s the amazing time we had last year. Hey everyone! Who here is interested in seeing Games on Demand at PAX South? Andi Carrison would like to help us make that happen! “I manage the Tabletop department for PAX South, and I’m looking to find the right folk to lead and coordinate a Games on Demand presence there. Last year (its inaugural year), there was no GoD at PAX South. I want to remedy that going forward, as it’s important to me that GoD has a presence at PAX. In short, I’d like to invite GoD to PAX South. So who’s interested in stepping up to make this happen? 114 Unique Games were played at Gen Con this year! There were 910 volunteer hours recorded at the show. 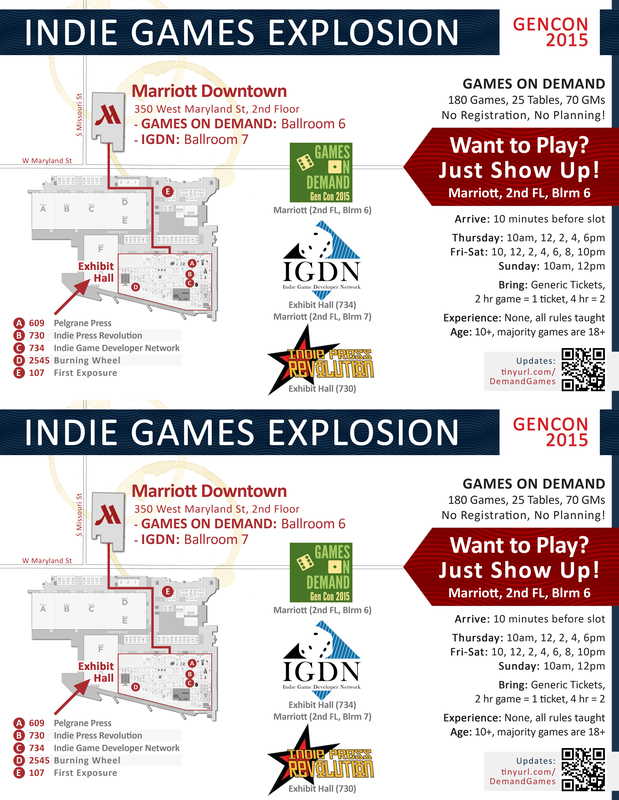 Are you going to be at Gen Con next week? Would you like to know where to demo, play, and buy all the great independent and small press games? 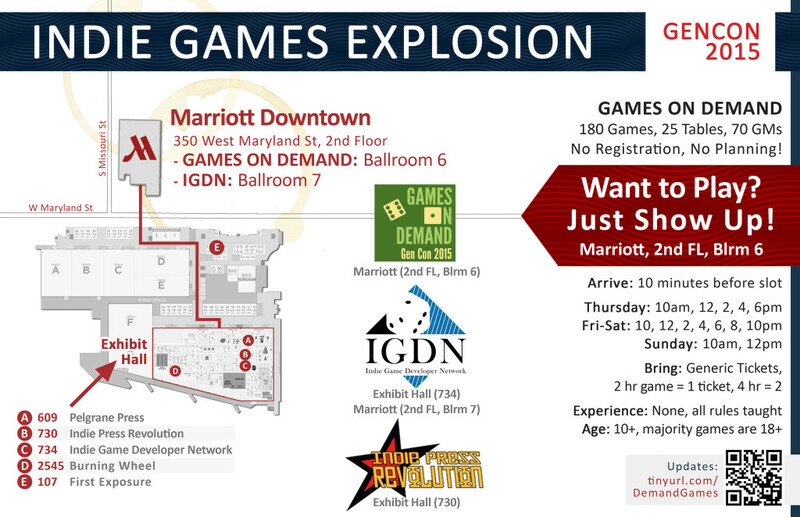 Check out our Indie Games Explosion map! Thanks to John Stavropolous for putting this map together.